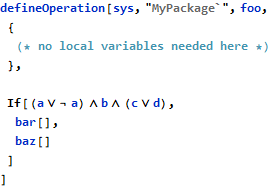 This article is the first in a series that is intended to demonstrate the flexibility of Mathematica as a foundation platform for Formal Methods. The evolution of the Formal Methods Toolkit (FMT) is a major motivation for this series. Such a construct can be also a problem with MC/DC testing, where it is required to demonstrate that individual conditions independently affect the result. 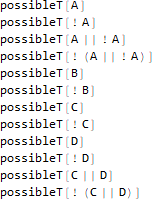 In this case, variable A has no effect on the complete expression and so it is not even possible to create an appropriate set of such tests. There is an added value from having static checks verifying that each logic subexpression has reachable both True and False values. Implementing such checks is relatively easy in FMT. The actual implementation requires some minor polishing, for example to ensure that human-readable descriptions are generated together with these statements. This feature will be available in FMT 2.0.